A video like no other. I’ve watched played around with this video 5 times already and going again for another perspective. Ollie O Flaherty gave us a few hints over the last few months about this collaboration with Pete Conroy and others, but its hard to grasp a 3D interactive surfing video without first engaging with it. This video gives us hundreds of different views from inside a barrel, along the line and the bottom of a monster wave… that’s if you can take your eye off the cliffs above! It gives insight into the view from down below and all along one of the most famous and majesty coastlines in the world. One view that’s lost on many ‘inside the barrel’ surf videos is the support crew carefully watching over. Near the end of the wave, a quick toggle allows you see a new perspective – that of Pete Conroy charging the ski behind with an electric smile on his face and an on-time pickup. N.B. must watch on a computer rather than smart phone. Use the interactive 3D toggle in top left corner. Love your site. Writing to you from cliffs of San Diego, CA… Sunset Cliffs. Writing a paper about surfing as a subculture and thought I’d google surfing in Ireland. WOW. What a great website you have. 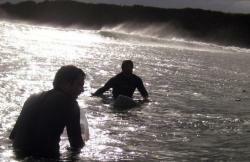 Have any history on surfing in Ireland. As a young girl backpacking through Ireland, surf culture DID NOT exist at that time. I’ve been to your cliffs a couple few times and could never imagine surfers there! WOW… so cool. Thanks for allowing me to view your site. Slainte.